Patients and their families have the opportunity to ask for help when they notice a subtle change in condition while in hospital. The REACH program is available in most wards at Gosford and Wyong hospitals and is based around the surf lifesaving concept of raising your hand for help. It’s best described as a patient and family activated response system and helps us ensure there is no delay in responding to small and subtle signs which could potentially lead to a decline in condition. In some cases patients cannot always personally express their symptoms and sometimes small changes may not be obvious to staff. Patients and their families can play an important role in identifying subtle changes that may signal clinical deterioration. The REACH process encourages patients, family and carers to initially talk with the nurses on the ward or medical team if they are concerned that something isn’t quite right. If they continue to be worried they can then escalate their concerns by placing a REACH phone call which will result in an independent assessment by a senior nurse. You may come across the colourful REACH posters and stickers in hallways, waiting rooms and at the bedside during your hospital visit. 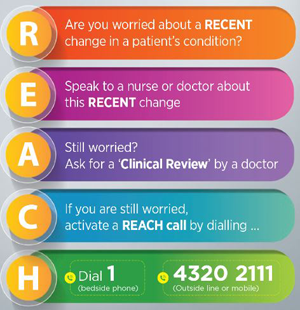 The REACH acronym is an easy and simple message to keep in mind if you recognise and have concerns over your condition, or that of a loved one.